I spent 2 weeks camping and vaccinating chickens. One week was in Monduli and the other in a village a few kilometers away. We trained 4 community vaccinators in each village by going with them for the first half of the day vaccinating chickens and having classes in the afternoons about the disease we were vaccinating against, how the vaccine works and how to properly use it, and general chicken care. My third week of camping was in the same village, working on building hafirs for water storage and training villagers on making sack gardens. Most of the teaching was done by demonstrations and physical work and walking the villagers through how to make each thing. My final week was spent manning a GSC BIA booth at the nane nane agricultural festival in Arusha. The best thing was being able to camp in rural areas, especially Lashiane, because we were able to have first-hand experience with Maasai culture, which not many people have had. I was most immersed during my 3rd week of camping, when I was the only SA volunteer left in the country so I camped with only Tanzanians. This and my homestay provided me with the most insight into Tanzanian culture. My work was divided between two different subjects. I did both community trainings in BIA and was one of the first groups to start the chicken vaccination program against Newcastle Disease. We did community trainings in Laiser (a sub village of Ilkaryon and Monduli (twice), and we did chicken vaccinations in Ilkaryon and Monduli. The trainings consisted of partially classroom lessons, where we would teach the basics of BioIntensive Agriculture, and partially of practical application of the lessons. With the group, we built a compost heap, dug a double-dug bed, and made a nursery and a sack garden. During vaccinations, we would travel by foot throughout a certain village for several hours in the morning vaccinating chickens and explaining the program to farmers, and in the afternoon would conduct lessons with the vaccinators about the disease and about their responsibilities. I think the work we were doing was very important and I could see the effects it was taking as we revisited certain areas and saw progress that had been made, so in that sense it was very rewarding and I felt like I was doing something. My time with my homestay family was amazing, they treated me as a daughter and I felt completely at home with them. I had many talks with them about the difference between American and Tanzanian culture, which provided me with an insight I would never have otherwise been able to gain. I learned so much from them, and they completely transformed my experience. I also thoroughly enjoyed camping, because it was a great way to establish camaraderie with my fellow volunteers that may not have formed otherwise. To put it simply, my favorite parts were homestay, chicken vaccinations, camping, and the relationships I developed, both with people in Tanzania as well as with other volunteers. New food security and nutrition USDA contract with Partners for Development. Based on GSC-Tanzania’s seven years of promoting food security in northern Tanzania through bio-intensive agriculture, and successful pilots of the Newcastle Disease Control project of its NGO partners, GSC-Tanzania and its partners propose expanding the promotion of organic gardening and improved rural poultry systems into a regional program bringing food security to over 2,000 smallholder farmers on both a subsistence and commercial basis. This program uses proven methods to empower rural producer groups by increasing the use of sustainable agriculture and kitchen gardens. In select communities this will also involve organizing village-level collection/buying/ selling points, ensuring quality produce through a participatory guarantee system of certification, encouraging rural poultry markets, conducting practical research and sharing knowledge on food preservation and appropriate irrigation skills with participant farm families. The program also will target families caring for Persons Living with HIV/AIDS. Market linkages ensure that profitable and equitable relationships will benefit rural producers, small and medium entrepreneurs and others along the value-added chain. Visit our website at http://www.globalservicecorps.org to find out more information about our programs in Tanzania! 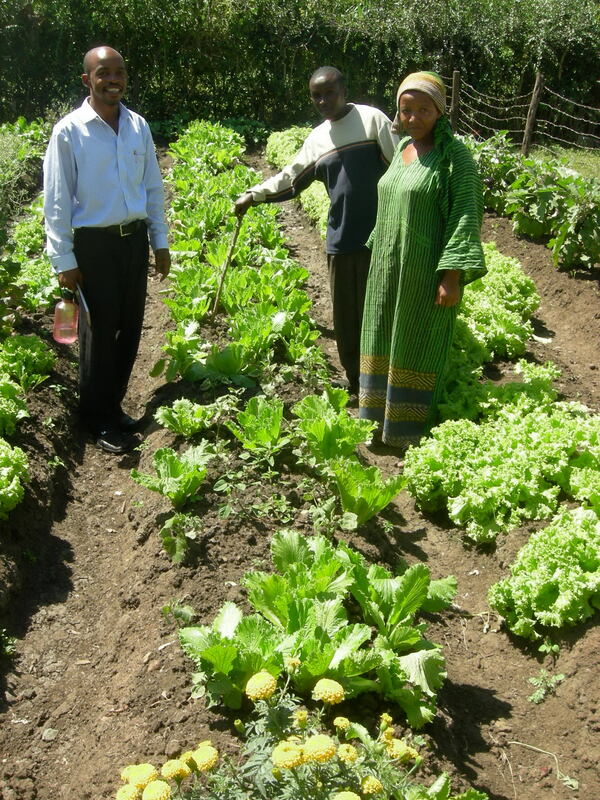 Editors note: The Kitomaris are a Tanzanian family who learned about bio-intensive agriculture through training provided by Global Service Corps sustainable agriculture program. The Kitomaris have six children, which they will struggle to put through school. In recent years the imperative of intensification has increased as farm sizes have become smaller through passing parcels to children. Few families live in traditional houses, and family sizes are getting smaller. This imperative has caused the Kitomaris to become fully converted to bio-intensive agriculture. Behind the Kitomari farmstead is a garden with eight large compost piles 2×1 meters square. Here, the Kitomaris share the secret of their success, and the reason they get so many visitors. In 2002, with the help of Global Service Corps volunteers, they learned to make compost and how to utilize it in ‘deep dug beds. Soon their farm had drawn the interest of visitors from Heifer International, and the Kitomaris became farmer motivators in fish and goats. The latter helped them to increase their compost-making to much more than they needed on their small farm, so they began to sell it! How strange that anyone would make a business of selling compost, but at Tsh 20,000 per pile it has proven to be a good income generator. Using the techniques taught by Global Service Corps, the Kitomaris have seven beds which produce abundant green vegetables for their meals, and they sell green, organic vegetables to their neighbors all through the year! Editors note: Lauren participated in Global Service Corps sustainable agriculture program in the summer of 2008. Thanks for the post Laura! Two months ago, I was sitting on a huge airplane with my eyes closed and feet anxiously tapping the floor below me. As we roared down the runway, I tried to remain calm but instead I was second guessing my desire to travel to Tanzania and volunteer with Global Service Corps (GSC), a nonprofit organization that emphasizes international health, HIV/AIDS education and sustainable agricultural techniques. I barely knew how to say hello in Swahili, had never traveled alone, and was always a little nervous to fly, especially when it came to take off. In fact, I was so nervous to fly that I repeated the word “safe” over and over in my head as the flight attendants passed through the cabin prior to departure, assuring the pilot that all passengers had their seatbelts safely fastened. I was jealous of their relaxed attitudes and wished I could just fall asleep like the snoring woman next to me who did not wake until our aircraft landed in another continent. When I was brave enough to look out the window, the airplane was already encircled by clouds and I could not believe that we had left the ground…it felt as though we were still on the runway! From that point on, my breathing eased, I stopped repeating the word safe, and was finally able to sit back, relax and enjoy the twenty hour flight to Tanzania. Upon arriving in Tanzania, I was greeted by a GSC representative who drove me to the hostel I would be staying at during my initial training. These first few days were exciting and informative. I was taught primarily about sustainable agricultural methods but also learned about the growing problem of HIV/AIDS throughout Tanzania. As a volunteer, I would be spreading my knowledge concerning agriculture and nutrition to various community members, but it was essential to receive training myself before helping others. I worked alongside a Tanzanian counterpart named Javasson for a week and my training occurred both in the classroom and outside in the demonstration farming plot. This method of learning was beneficial because I first learned about the theory behind particular practices and then ventured outside to put the practices in action. With some help, I made a standard sized compost pile, dug a double-dig garden bed, built a sack garden, and made a natural pesticide spray from papayas. During these activities, Javasson explained that proper farming techniques not only improve overall crop yield and increase plant health, but also indirectly benefit human health as well. Organic vegetables and fruits grown without the addition of chemical pesticides are better for the environment and for our own bodies. In addition to learning sustainable agriculture techniques, Mama Betty, a lady with HIV/AIDS came to talk to the volunteers about the importance of nutrition and its role in preventing further symptoms of the disease. She explained that those suffering from HIV/AIDS often feel weak and helpless. Although she felt this way when originally diagnosed with the disease, she claimed that proper nutrition such as a diet rich in vegetables, has allowed her to regain the strength necessary to continue with her daily routine. Mama Betty advocated the addition of sack gardens to homes for HIV+ people. 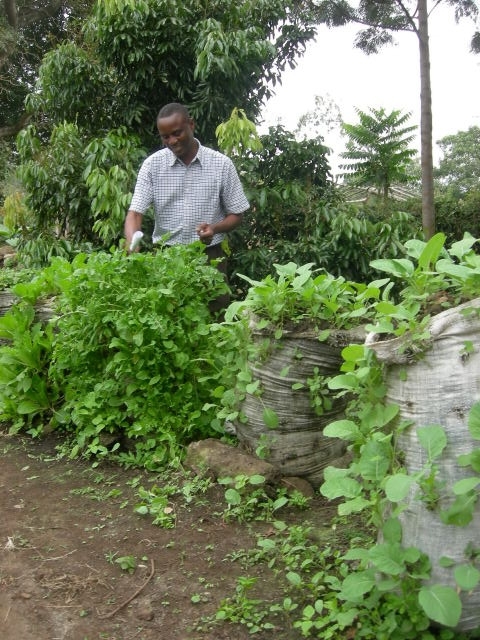 Sack gardens are low maintenance and various types off immune-boosting produce can be grown and incorporated into meals and/or tea to allow for better nutrition. Mama Betty was extremely open and I appreciate her willingness to share her story. Editors note: Jennifer R. is a current participant in the HIV/AIDS Education and Prevention Program in Tanzania. She will be working with us for the next six months. We look forward to receiving more posts from her throughout her time in Tanziania! Thanks for the post Jennifer! This past weekend, I had the pleasure of traveling to a place that was utterly other-worldly. It was like I walked onto the Discovery Channel or into a National Geographic special. I am going to use this word a lot in this entry, but I am in utter awe of all that I witnessed, just utter awe. There are few times in life when you experience true awe, I spent an entire two days like that. It was magical, mysterious, mystifying, miraculous, shocking in a fabulous way, or in a Sidipi (said see-dee-PEE) way, which is the Maasai word for fabulous. My descriptions here will never do it justice. I just cannot describe the stirring in my heart that happened while we were out in uncharted territory. It was as if I was standing in the spot where the birth of the human species took place, watching it as it would have taken place at that moment in history. It was truly an experience of a lifetime. Here is some general information on the Maasai. They have been living this tribal lifestyle on these lands of Tanzania and Kenya for hundreds and hundreds of years and have actively discouraged modernizing or changing their nomadic way of life. It was like I stepped back in time to watch people live before the dawn of modern civilization. The traditional Massai Lifestyle centers around their cattle which constitutes their primary source of food, but they do also grow maize quite a bit now. The measure of a A Maasai myth relates that God gave them all the cattle on earth, to be put into their keeping. They are a large but very close community that works together to raise the cattle and the children and cultivate the lands that they live on. The society is patriarchal and polygamist, the family we stayed with had 1 baba (dad), 2 mamas/wives, 20 watoto (children), 10 from each wife. They all live together on the compound of land called a Boma, along with all of the cows and goats. Maasai men’s wealth is in terms of his cattle and children. A herd of 50 cattle is respectable and the more children the better. A man who has plenty of one but not the other is still considered poor by Maasai standards.